If the crystal, glass-like water stream & the “jumping effect” of Jumping Jets is described as magical, a walk through an array of them can become an unreal experience. Jumping Jets have a certain wow-factor; they have a special way in attracting audience and becoming the focal point wherever installed, in open pools, in dry-deck applications, inside or outside*. These jets are always the water shape of choice, for events, music halls, theaters, malls, amusement parks, hotels & high-end residential applications. Precision is the essence of Jumping Jets and in order to achieve the highest quality available in the market, we utilize an array of state-of-the-art machinery like laser cutters and CNCs to manufacture these jets; for instance, the stainless steel nozzle has a tolerance of 0.001 mm. The principle of Jumping Jets is the glass-like water stream which makes it look totally still and lively at the same time. The nozzle inside jumping jets is what forms this water effect, and this is why we made this nozzle out of Stainless Steel. It’s literally never, ever, going to corrode, tarnish or disintegrate in any way. Especially not by the medium it flows through it – water. Other Jumping Jets in the market are equipped with brass or bronze nozzles, which is a plain oxymoron as these nozzles tend to corrode by water itself. The secret behind splash-free cutting is in the architecture of the cutting mechanism. Jumping Jets are made to pop, burst, jump. Over and over. Day after day. We couldn’t rely on low-end solenoid or low-torque micro-motor (servo or step) based solutions. 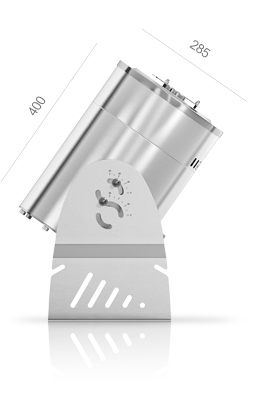 We designed from scratch a brand new type of cutting mechanism. Its reliability and high speed cutting lies in the simplicity of its design and the splash-free cutting’s secret is in the architecture of the two-stage (optionally three-stage) internal drop-catcher. This piece of precision engineering and manufacture is what ensures you have a ruin-free, splash-free crystal clear water stream flying in the air. Beautiful to see, challenging to conceive. Fontana Jumping Jets feature an amazing 8W, single-chip, four-core RGBW LED luminaire inside – a cutting-edge member of TheSmartLEDTM family which offers exceptionally intense illumination & millions of vivid colors. Stunning illumination, low energy consumption and an amazing lifespan of nearly 100.000 hours, lead to the brightest and most energy efficient Jumping Laminar Streams. Apart from Red, Green and Blue cores, this luminaire sports a fourth one: White, which multiplies the available color spectrum by another 256 steps. This translates to more vibrant colors to choose from and amazing, dynamic light sequences. These vibrant colors make jumping jets stand out in the dark and offer this amazing, magic kind of effect. The powerful luminaire makes sure that the light will travel through the entire stream, from the output of the nozzle up to where the stream meets the falling surface. You will also notice that the light creates a colorful glare in the falling point – exactly like fiber optics. Note that for the stream to be entirely illuminated, the water must be absolutely clear. The luminaire of the Fontana Jumping Jets can be controlled by a Fontana RGBW controller or through DMX, giving full flexibility to the end user. You can select any color among an endless spectrum of vibrant hues or choose an RGBW sequence with variable speed. In applications with Jumping Jets in array arrangement, it is always fascinating to choose different colors for every jet and this luminaire is addressable to make it as easy as possible. A brand new Fontana developed device with remarkable control characteristics and a bundled software that provides full control of every feature of a fountain. You can control each jumping jet separately, create your own water & light choreographies, configure automations such as water level and wind control and easily create the operation schedule. A typical way to control Jumping Jets is through a universal PLC. Such a system is custom made according to the specifications of each application, regarding the amount of Jumping Jets to be controlled and the automation requirements. Note that an additional device is required to control the lights. You can use your own DMX software or console or choose one of the available by Fontana ones and control the Jumping Jets. 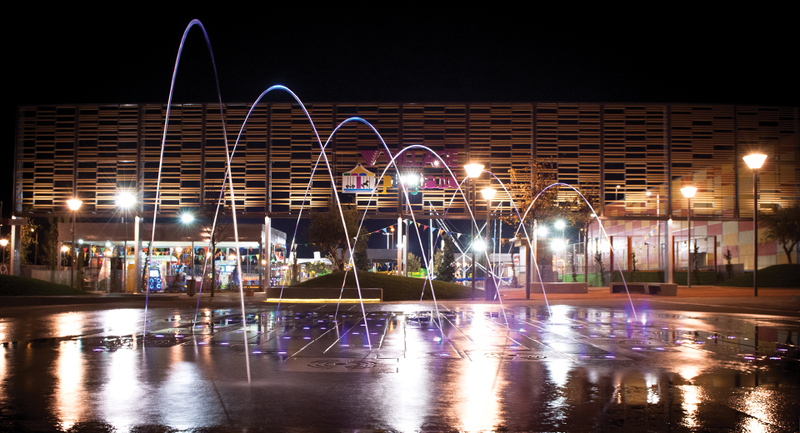 Take advantage of the endless capabilities of DMX applications, create choreographies and sequences both for water and light, and the Jumping Jets will follow them accordingly. Engage with your Jumping Jets in an intuitive, fun and absolutely safe way. The iPad integration essentially gives you functionality that reaches the margins of magic. You can have your fountain run fully automated, but you can also take control, choose your favorite choreographies and light shows and also change them on the fly through the amazing iPad’s interface. *Jumping Jets’ water effect is vulnerable to windy conditions and water quality. Always use clear/treated water.